Amber here- writing from Lisa's organic farm in Kingfield, ME. We decided to hop off the trail for a bit to get a shower and call our family. Lisa let us work on her farm in exchange for a night stay and an organic breakfast! The day has been perfect. It's times like these that we all look forward to. The weather could not be any better (seriously ... blue skies for miles) and the scenery is like something out of a story book. 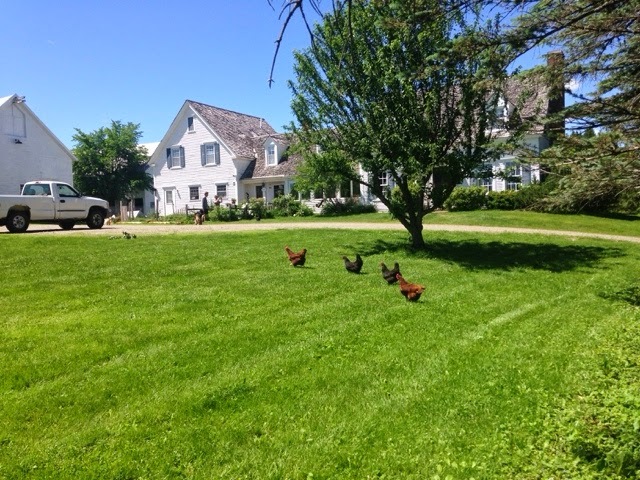 My favorite part of her place is watching the 35 range-free chickens run around happily. Let's see, the past few days have been pretty great. While we were in Monson, we loaded up on food and bugspray. So no more growling stomachs and we have way less bugs to combat. We are starting to see more hikers which is nice. Some are cool. Some are odd. All are respected for being out here. My recent thoughts: These mountains will wear you down. When everything is pushing against you it just seems so easy to give up. Waking up in a wet tent, packing up in the rain, then hiking all day after hiking all day yesterday . . with wet feet is in no way enjoyable. Neither is hiking up 500 ft inclines with bugs biting and then twisting your ankles when you hike down 90 degree declines. However, adventure awaits for those who persevere. Life is full of mountains we must climb. I have learned that just like in life outside the trail, one must dig deep. So whatever it is that is weighing you down, hang in there! You will reach the top of the mountain if you keep on going. We will be in Stratton in a few days. I should be able to post some of our photos. Thanks to everyone who has been looking out for our loved ones back home. Sending positive vibes your way! "No Magic potions, no fairy dust, no one to do it for you. Just me, I will push you, show you, how to put one determined foot in front of the other. That's what I will do. I am inside you... I'm called your "inner strength". DIG DEEP down and find me!" Sounds like a great place. Stace said he really enjoyed the stay there. Plenty of adventure ahead and a lifetime of memories. Be strong and together you will get through. I look forward to the next call and news each day.